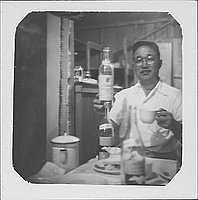 Man with eyeglasses sits behind a table holding up a liquor bottle in his proper right hand and a white tea cup in his his proper left hand at Rohwer concentration camp, Rohwer, Arkansas, April 1944. Table with two empty liquor bottles, a white lidded pot and remnants of a meal is in foreground. Man wears a white shirt and smiles at viewer. Written in pencil on back: [circled letter] D. Written in pencil on back: April 1944.